An introduction to Hawaiian slack-key guitar. When telling the story of the Earth it is people that tell that story. To give expression to these stories people incorporate theater, art and music to communicate emotion and feelings. The history and culture of a people, their relationship to each other and to the environment is reflected in their songs and music. The Raga of India, European Folk, Middle East, Africa all have ethnic voices and local instruments that speak of the region. Hawaiian Slack-Key guitar is a good example. Slack-key guitar originated on the Big Island of Hawaii. It is a finger style picking using an open tuning in which the six strings form a single chord. The Hawaiian name for this style is called kī hōʻalu, which means “loosen the key”. Slack-key has been a part of family entertainment and back yard gatherings for generations and only in the past few decades has it found a wider audience. Modern and contemporary music rely heavily on electronics, equipment, studio engineers and special effects to produce music. Slack-key players have retained traditional roots. All that is required is an acoustic guitar to tell the story and express true Hawaiian spirit. Ledward Kaapana, grand master of the slack-key guitar. Local boy from Kalapana on the Big Island, no tv and not much radio in that area, grew up with family and friends making music for entertainment. The following couple of songs were nicely recorded by Fran Guidry playing guitar with Ledward, sitting in the garage or out in the backyard. If you have a few minutes I encourage you to listen. This feel-good music is traditional Hawaiian style. Each video is 4 to 5 minutes long. The camera and sound quality professionally done. The action is just a couple guys playing guitar, nothing dramatic. The music is for your ear. If you need to get up and stretch or open the window, now is a good time to do it, and just listen to the music playing or maybe pay attention and learn a few new guitar licks. These 3 short videos are an excellent introduction to Hawaiian slack-key guitar. 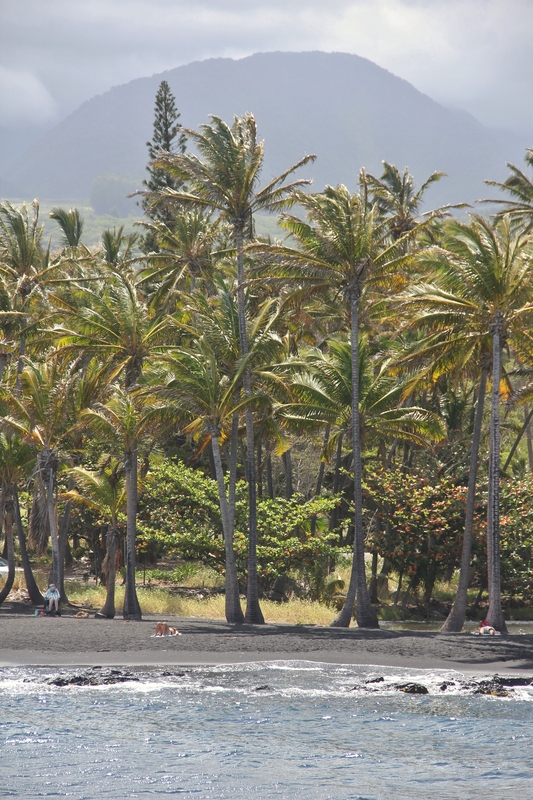 “Back before the lava came, the little village of Kalapana in the district of Puna on Hawai`i Island was known for three things: a magnificent black sand beach, the queen’s bath, and a remarkable concentration of musicians. Members of the Kaapana and Konanui clans settled there, with Fred Punahoa, George Kaapana and his wife Tina among the most widely known. The parties were legendary, with various family members showing off their favorite numbers and jam sessions that went on for days. All over the world it happens. a couple guys getting together with a few instruments and having a jam. Traditional culture is kept vibrant with music. Slack-key (kī hōʻalu) from the Big Island is still being played out in the back yard, Hawaiian style. Support local musicians and the arts. This entry was posted in Air, earth and tagged Hawaii, music, Society, sustainable. Bookmark the permalink. Beautiful!! Something about stringed instruments, no electronics that is so perfect. These are so authentic and real… lovely post thank you Dohn…. so lovely. . . drifting away . . . Wonderful music and feeling. I was introduced to slack-key guitar via Ry Cooder, who performed with Atta Isaacs and Gabby Pahinui. Thanks for posting this great vids! Gabby is the Godfather of slack-key. He was the 1st to record it, around 1946 and Ry Cooder has been a favorite of mine for many years. Glad you enjoyed this. Mahalo. Beautiful, Dohn. Thank you for sharing.